The film opens idyllically when a Chinese man, Jun (Ignacio Huang), takes his girlfriend on a boat trip on a picturesque lake to propose to her. This image is quickly shattered when a cow falls from the sky, killing Jun’s girlfriend. The shattering of Jun’s happiness and the serene scene becomes a precedent for the rest of the film. It is this event which will ultimately change the life of bad tempered iron monger Roberto (Darín). 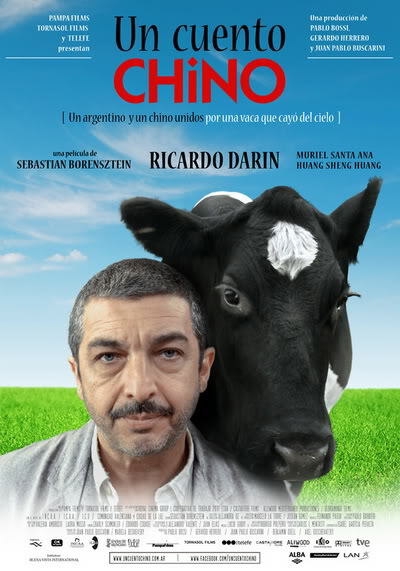 Predominantly set in Buenos Aires, Un cuento chino is the story of Roberto who, in a series of unlikely events, is brought together with Jun: who has come to the city in search of his only living relative. A chance encounter in the street prompts Roberto to (somewhat unwittingly) offer the homeless Jun his help and a place to stay. Despite the monotony of his own life, the routine-obsessed protagonist is fascinated by chance; and although unable to communicate with his Chinese guest, it is the randomness of their being brought together that will convince Roberto to reassess his rigid view of life. Through a series of comic encounters and shocking (almost unbelievable) events, Borensztein has created a poignant and thought provoking outlook on the unpredictability of life, and one that definitely strikes a cord with Argentina audiences.